The excerpts given in last week’s column from the old Bryn Mawr “Record” were found at the back of the Saturday Club pictured above, Since only parts of the newspaper remained, and these so brown with age as to be almost illegible, and so frail as to crumble at the touch, it was difficult for your columnist to read the date on which it was published. In last week’s column it was given as May 9, 1891. Your columnist has since decided that the year was 1901, not 1891 The news is therefore 53, not 63 years old. An interesting note was added to last week’s column by A.M. Ehart, editor of “The Suburban,” giving the information that the old newspaper must have been a copy of the Bryn Mawr Record, a periodical which has long since been discontinued. This remarkably clear picture of the Saturday Club is especially interesting in that it shows the back of the building as it looked soon after it was finished in 1898. There are several old pictures of the front of the building, but this particular one seems to be the only one showing the rear view. It was taken from what now includes the rear yards of the Albrecht Flower Shop and the large building which houses the Wayne Beauty Salon on its first floor. The right rear side of the Club House now looks quite different from the picture, as it was enlarged some years ago to make the board room. Several windows were added, and a door replaced the window in the alcove. The house just showing to the left of the picture is one across the street on West Wayne avenue, that was originally the property of Mr. and Mrs. A.M. Ware. It is older than the Saturday Club by several years. It was later occupied by Dr. and Mrs. H. Lee Scott, and quite recently, it has been remodelled into apartments. The home to the right of the club house, directly adjacent to it, has been for some years the headquarters of the Wayne Neighborhood League. So much for the old picture. And now to continue with Radnor township news as given in the Bryn Mawr “Record” of May 9, 1901. Radnor High School had “just added lawn tennis to its list of out-of-door games,” the Board of Directors having granted permission to use that portion of the school grounds between the high school and the grammar school. The Athletic Association laid out four courts with others to be added as needed. Just why tennis was considered particularly suitable for the girls it is now difficult to say. But “this form of exercise” was “introduced primarily for the purpose of giving the girls some kind of out-of-door exercise.” The regular indoor gymnastic work of the school was suspended for the balance of the school year in order to allow time for instruction in tennis. Radnor’s relay team had just journeyed to Swarthmore on the previous Saturday “to take part in the races given in connection with the annual college games. Radnor easily won first place with Lower Merion in second place, and Norristown High School’s baseball team had just scored a victory over the Radnor team by a 38-13 score. The latter was soon to play Lansdowne High. One of Radnor township’s leading citizens, John H. Converse, of Rosemont, had been given a reception at the Academy of Fine Arts in Philadelphia in recognition of his services to the Presbyterian Church. An audience, numbering about 2500, was present, including Justices of the Supreme Court, many public officials, officers of financial institutions and numerous clergymen of several denominations. In presenting a silver loving cup to Mr. Converse, Dr. William Henry Roberts, of Wayne, spoke for the assembled clergymen. Then, as now, the historic aspect of the section of the country which we live interested the local columnist. In preparation for the Saturday Club’s “Open House” on Thursday evening of last week, a number of old club treasures, reminiscent of days long past, were dusted off and polished up under the direction of the incoming president, Mrs. J. L. Vosburg, and her hard working committee. Among these treasures was a framed picture of the club house as it looked in 1898 which your columnist had brought to light from some desk corner. In 1898 J.D. 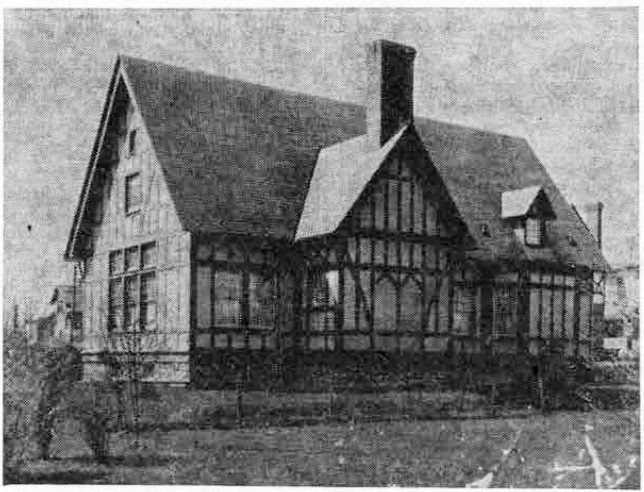 Lengel had just finished the club house architectural plans prepared by David Knickerbacker Boyd. Both men were long time residents of Wayne. Only part of the newspaper was used and that part does not have the name in full. The only clue is that it was published in Bryn Mawr and that it was “The R…,” the rest of the name having been torn away. The editor of “The Suburban,” whose memory is long one, can give our readers in the following footnote information on the subject. (The newspaper was the Bryn Mawr “Record,” founded in 1903 by the Suburban Publishing Company, to supplement its chain of Main Line newspapers, which extended from Downingtown to Overbrook. The editor was James E. Dougherty, a former postmaster at Haverford, and later manager of the Bryn Mawr Ice Company. The paper was discontinued in 1906, after “The Suburban” plant in Wayne was destroyed by fire, and further publication became impossible. The interesting thing to local readers is that this 63-year-old Bryn Mawr newspaper contained so much news of Wayne and of Radnor township. There is a half-column of “Radnor Notes,” a quarter of one entitled “Round About Strafford”… Radnor High School rates a third of a column, as does the Saturday Club… there is a short story about a match between the St. Davids Cricket Club and Huntingdon Valley Country Club cricket teams. Players from the local club included Miss M. Dallett, Miss Benners, Mrs. Bergner, Miss Warren, Mrs. Hallowell and Mrs. Montgomery. This group had a “team total” of two as against their opponents’ team total or 49! Then there are the Wayne advertisements, including one of the Wayne Title and Trust Company, when Louis H. Watt was president; F.H. Treat, vice-president; Harry C. Hunter, secretary and treasurer, and Christopher Fallon, solicitor and title officer. Another “ad” starts off: “Shall we send our Wagon for your Laundry bundle?” It was placed by the Wayne Laundry Company, which assured the customers that it “will suit you better than any other laundry has done or will do.” Is there anyone among our readers who remembers the Wayne Laundry, where it was located and by whom it was operated? A front page article concerns a topic as timely today as it was 60 years ago – that of fines for “auto speeding.” But with a difference! For in 1891, Lower Merion was fixing a penalty for “exceeding 10 miles an hour.” This fine would be $10 for the first violation, and would be increased to $25 for the second offense and $50 for the third. “The same conditions apply to bicycle riders,” the statement continues, adding “under the new ordinance, when a horse becomes frightened at an automobile the driver must come to a full stop.” And the paragraph concludes that “in adopting the new ordinance the commissioners followed the example of the commissioners of the adjoining township of Radnor.” Our township had evidently pioneered along the Main Line in the matter of speeding automobilists. It is interesting to note that even in early May “the departure from the city for the nearby country seats, seashore homes and mountains resorts” had already begun. “Society is leaving the city much earlier this year than in former seasons,” the Bryn Mawr paper continues. “Many homes in the fashionable sections of the city have been closed during the past two weeks, the families having moved to the country for the summer,” as have “Mr. N.F. Folwell and family.” Mr. Thomas Newhall, of Baltimore, “paid a flying visit to Strafford this week” and ”Mr. and Mrs. A. Horwitz are occupying one of the Smith houses.” All these are still interesting names to those among us who are really old timers. Because pictures always highlight the interest of “Your Town and My Town,” your columnist makes an earnest endeavor to find one or more for each week’s issue. Hope is still not lost for the desired illustration when none comes to hand in time to print with the story, for some reader may have put the right picture among his or her mementos. And this reader may be willing to send in the picture for use in a later issue. So it was with Devon Inn, a brief history of which was given in the series on large fires which have occurred in this vicinity in past years. In the early morning hours of January 18, 1929, this famous Main Line hostelry burned to the ground. The pictures illustrating today’s column show two views of the Inn as it appeared in its heyday. They were sent to your columnist by James L. Kercher, of Conestoga road, soon after the story of the fire appeared in “Your Town and My Town” in the spring of 1952. The reverse side of this picture postcard of the Devon Inn describes it as the “social center or the Main Line,” located in “beautiful Chester Valley” and “open from May to December.” A. Stanley Stanford was proprietor at the time the postcard was made and K. Rush was associate manager. Among its attractions they list the Devon Horse Show, polo matches, kennel show, Rose Tree Horse Show, Belmont trotting event, Chesterbrook races, Bryn Mawr Horse Show and Devon fancy cattle show. And these are not all, for the list continues with the Horse Show Ball, Spring flower show, golf and tennis, private theatricals, Bal Masque, Autumn flower show, auto exhibition, the County Ball and Devon Inn’s beautiful Japanese Floral Cafe. This cafe was evidently located on one of the Inn’s wide porches, as shown in the second of today’s pictures. The history of this old inn is an interesting one. The original structure, called the Devon Park Hotel, had been built in 1876 to house the overflow of visitors to the Centennial Exposition in Philadelphia. Three years later, fire destroyed the first building, but it was replaced soon after by a larger and more ornate structure, erected on the same site. This is the one shown in today’s picture. For some years there was great rivalry between the Devon Inn and the Bryn Mawr Hotel for the patronage of fashionable Philadelphia summer boarders. Located on the site of what is now the Baldwin School, the Bryn Mawr Hotel was owned by the Pennsylvania Railroad. This rivalry ended in a complete victory for the Devon Inn, when the Devon Horse Show made its initial bow. The show immediately became a nationally famous event, with entries and visitors from all over the United States. The socially elite from New York and the Long Island Colony, from Boston, Chicago and many other cities throughout the country filled the Devon hostelry to capacity each horse show season. 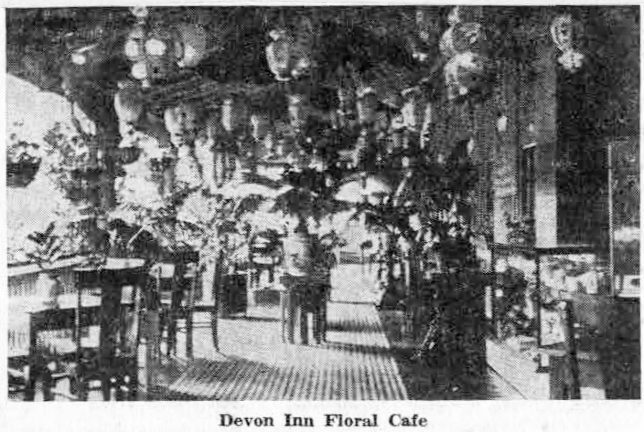 When the Bryn Mawr Hotel burned to the ground, the Devon Inn lost its only serious rival. The popularity of the latter continued for some years. 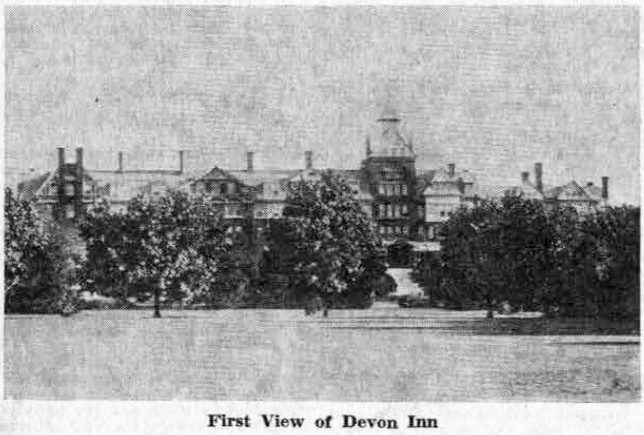 Then in 1924 the property was sold and the building converted into the Devon Manor School for Girls, but two years later the Devon Park Hotel Company had to resume possession of the property. After another two years Major Milton G. Baker (now Major General Baker) acquired it for the Valley Forge Military Academy, which he was just organizing. After expenditures of more than $200,000 on renovations to the building, the school opened in September, 1928, with an enrollment of about 150, and many more were expected for the next year, since the building could easily house several hundred students. But the military academy was destined to remain in its original building only a few short months. Early in the morning of January 8, 1929, a fire, starting as a small and apparently inconsequential blaze, in the fourth floor of the building soon swept through the entire structure, levelling it to the round. By dawn only the smoldering jagged sections of the brick walls remained. These grim reminders of the fire pointed skyward for more than a year afterward when in April, 1930, they were shattered to the ground by the force of the Devon fireworks explosion. And thus ended the story of the most fabulous hotel the Main Line has ever known.